Grate coconut meat. Add about ½ cup water to grated coconut meat and squeeze out about 1 cup milk from the grated coconut. Strain the milk and set aside. This makes the thick coconut milk. Pour additional water into coconut meat and squeeze out more of the milk to make 5 cups of liquid. Strain this liquid into stockpot. Bring liquid to a boil. 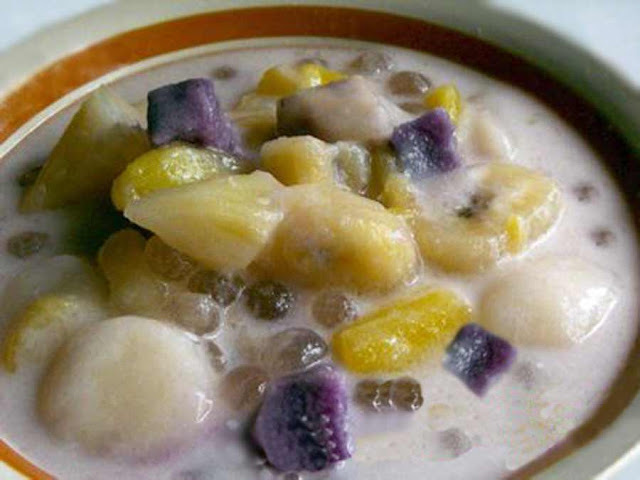 Add the gabi, ube, camote and sago. Bring back to a boil then lower heat to simmer. Continue simmering until gabi, ube, camote and sago are almost tender. Stir often to prevent ingredients from sticking to the bottom of the pot. With lightly oiled hands, shape galapong into 1 inch sized balls. Drop balls one by one into the simmering liquid. Stir in bananas and langka. Simmer until fruits are almost tender, about 10 minutes. Blend in sugar and the reserved 1 cup thick coconut milk. Continue simmering until ingredients are tender but still firm and the liquid has thickened, about 5 more minutes. Leet cool a frew minutes before serving. Do not cover pot until guinataan is completely cool to prevent spoilage. Note: the proprtions of the ingredients are just a guide. You may use more or less of each ingredients, depending on your personal preference. End.